For Old World charm amid bucolic splendor, the French chateau-inspired architecture and gorgeous natural surroundings of the Lafayette Park Hotel can’t be beat. If you'd like to add even more cosmopolitan zest and greenery to your stay, head over to the neighboring city of San Francisco, where every year the Golden Gate Park offers millions of guests the opportunity to enjoy more than 1000 acres of verdant gardens, playgrounds, picnic areas, walking trails, lakes, and more. The Victorian Conservatory of the Flowers (and at 139-years-old, it is, in every sense, Victorian) houses some 1700 varieties of aquatic and tropical plants. We’re especially enamored of the brilliant orchid collection and the Imperial philodendron, which is nearly as old as the conservatory itself. 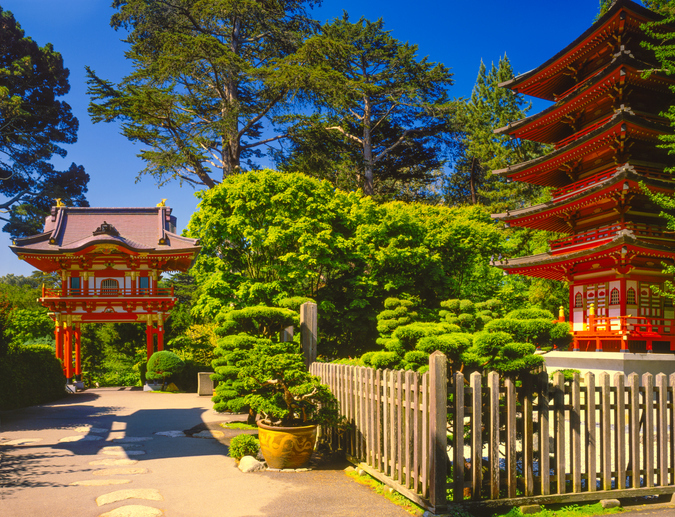 For a quick trip to the other side of the globe, you can check out the Japanese Tea Garden, where the koi ponds, cherry trees, and multi-story pagoda are like images out of a fairytale. Those are just two of our favorites. To see the full dazzling array of gardens, head over to the Golden Gate Park, an oasis of international wonder right next door.